Why is our new Winter Glove the best? 1. The entire glove is made from our Racing Grade Stretch Material Made with Dupont™ Kevlar® Fiber. This is the only synthetic material approved for road racing suits. Stretch is 5 times stronger than leather. Doesn’t absorb heat like leather or nylon. Doesn’t loose any tear abrasion strength each time it gets wet, like leather. In fact even after many years of use the Winter Gloves will have the same exact tear/abrasion strength. Stretch is less than half the weight of racing grade leather. An extra layer of a new Blended material is in the palm and fingers of the glove. This new blend is 10 times stronger than the best leather in the world and has far more abrasion strength. 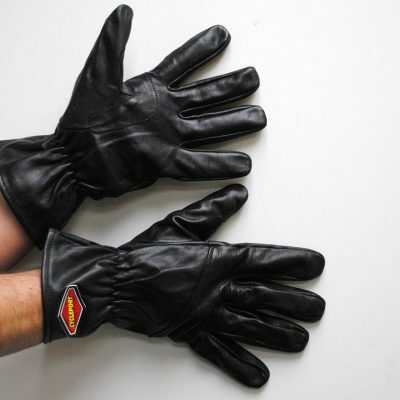 Many riders today spend up to $300.00 or more for the higher rated leather gloves. These same riders see in many cases the gloves falling apart after 8,000 miles of use. This premature wearing out is caused by leather getting wet from the riders hand sweating or getting wet from the rain. Each time leather gets wet and dries it can loose up to 20% of the tear/abrasion strength. Water has no bad effects with the Stretch Material. 2. Strongest seams of any motorcycle glove ever made. Leather weakens when holes from the needle poke through the skin. Our blended materials don’t weaken when needles for stitching go through. We also use a far stronger thread that can be used for leather. 3. The new Winter Glove will out perform any other winter motorcycle glove ever made. 30F to 85F in comfort. Glove is 100% Waterproof/Windproof/Breathable. For a winter glove it is thinner and lighter in weight than any other cold weather glove, providing the ultimate in comfort. 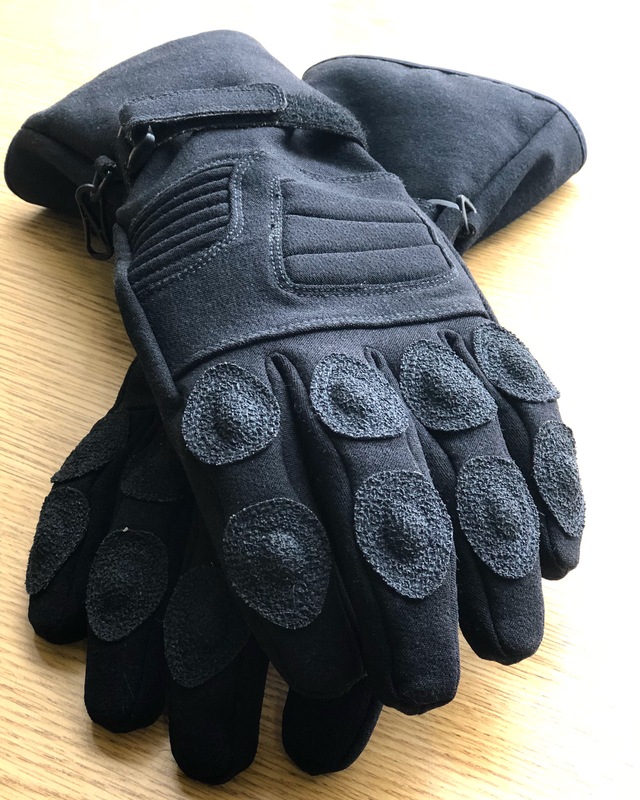 No other waterproof glove will perform as well as the Winter glove in the warmer weather yet still perform well in the coldest weather. • Rated for 30F to 85F. 100% Waterproof/Windproof/Breathable. 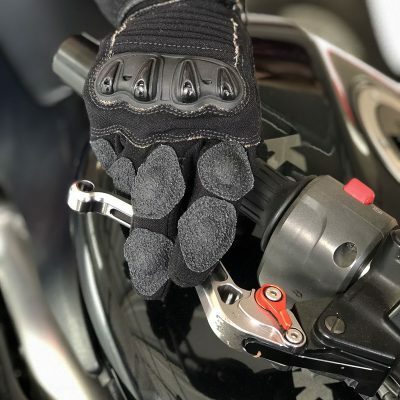 This is the most versatile motorcycle glove ever made. 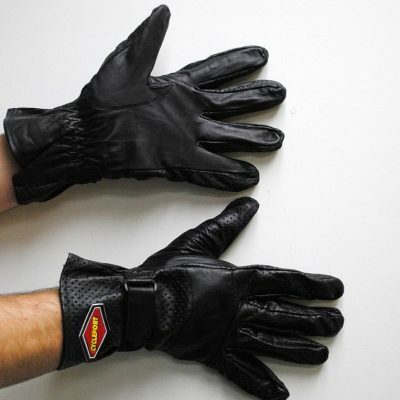 • Entire glove is made from Stretch, providing the highest tear/abrasion strength of any motorcycle glove ever made. Extra layers of a new blended material in the palm, inside fingers and over the top of the knuckles. This new blend is 10 times stronger than the best leather. • Stronger stitched seams than any other motorcycle glove ever made. • Gloves will stay on in a tumble. Velcro cinch on the wrist and forearms. • Extra long gauntlet that keeps out rain and cold weather. • Provides more comfort in cold/hot/wet weather than any glove ever made. A. First time you crash the protection the Winter Glove provides will more than pay for itself. What are your hands worth? B. The Winter Glove will last 5 times or more longer than the best leather gloves. C. If you want the best, most comfortable motorcycle glove ever made, this is it. If you have problems now with gloves try out the New Winter Glove. It will be the best investment ever made on a motorcycle glove. Click on this link and follow the steps: Glove Sizing Guide. Trace your hand on a piece of paper. Draw one to five inches from a ruler both horizontally and vertically ÂÂÂ on the same page. Write your name on the paper with the type of glove. Fax tracing to: 760-752-9317. Note: Faxes appear to us in a different size than sent. Marking from a ruler helps us to scale the tracing. Click on the above Glove Sizing Guide link. Go to the bottom of the page and click on: Glove Sizing (635 KB) open the file the pops up. Copy the hand scales at 100%. Match your hand with the correct size drawing. This is the best way for a proper fit.